Matt and I are hoping to adopt. But adoption costs an arm, a leg, and a lot of blood, sweat, and tears! Not to mention the financial aspect of it! lol So a few weekends ago we hosted a yard sale to raise money for our future little one. It was HUGE! I had a month of planning and gathering donations and promoting it like crazy and it still didn't feel like enough time! We had everything: clothes, shoes, toys, baby stuff, furniture(large and small), china, small appliances, decorations, books, games, and tasty treats! It was amazing how many donations we received. Everyone was willing to part with their household goods to help us! And some friends let us borrow their garage and yard! (We live in an apartment, it's a little difficult to have a yard/garage sale with no yard/garage!) We were way in over our heads with this thing! WOW! So after the conference and spending a few days with friends, We went down to St. George UT to spend time with my parents!!! While we were driving we listened to Harry Potter and the Half Blood Prince. We love books, and have enjoyed the Harry Potter series! But while we were listening I noticed something very funny! It was a Utah license plate that said MUGGLE!!! It was perfect timing too! The story was talking about muggles!! I grabbed the camera and Matt got close enough and I got a picture!!!! Sadly however, that was one of the great pictures that was lost. I still had to share though! When we made it to St. George it was so hot! But it was so wonderful to be in my parents tiny apartment with the WHOLE family!!! *A little background- one of my brothers and my sister haven't really been on "speaking terms" for the last 6 years. But while we were there they decided to start working things out! * It was so comfortable to have everyone in the living room on the couch just hanging out and joking around! I had thought that it might feel monumental for everyone to be there but it felt natural, like the way it is supposed to be! While we had everyone together I knew we HAD to do family portraits! The last family portrait was about 17 years ago!!!! Just after my sister Jericca was born!!! So being the family portrait photographer I forced the issue. Most of the family knows about my bossy and obsessive ways when I'm behind the camera(I'm not that bad!) but Josh, my youngest brother, was in for a shock!!! 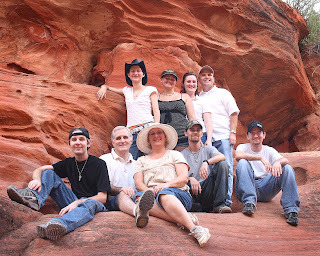 We decided it was be fun to go out to the Red Rock Canyon and hike and do pictures. It was a lot of fun! And it was so pretty out there! We stoped a lot to do a shot here and there. But we got some great shots!!! Anyways, here is my family! Sorry about leaving you on that cliff for such a long time! My boss lady at the studio had me working a whole bunch of hours while she was on vacation. I know you can find it in your heart to forgive me! So where were we? Ah yes! The conference. 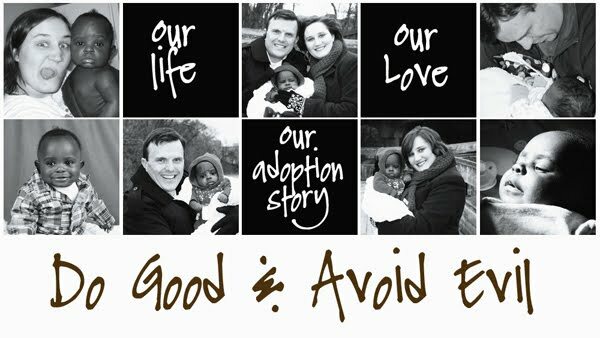 So FSA(Families Supporting Adoption) held a conference in Layton UT with classes for everyone in the adoption triad. We of course attended the adoptive parent classes, but the kids classes and Birth Parent classes looked really good too. There was only one class that we wished we hadn't gone to. It was just a bit too negative, which was really sad. The big event was the keynote speaker, Troy Dunn. Wow! He was amazing! He talked a little about his company and what they do...his TV show...and even about his own family. He has an amazing testimony of adoption. It was truly inspiring. I am so glad that he was able to take the time away from his family to speak with us. "My mom introduced the beautiful concept of adoption in a very simple manner," Brother Dunn said. "She said, 'There is something that is called prayer trading, and we're going to trade prayers with somebody. Somewhere out there is a girl praying for a good family for her baby. We are going to pray for a good tummy with a baby in it, and we are going to answer each others' prayers.' "
We really enjoyed our time at the conference. The classes were jammed packed with information and we walked away a little overloaded. =) Thank goodness for all the handouts they gave us, otherwise I'd forget everything we heard! We tried to attend a good varity of classes. We did a few parenting classes, finacial classes, marketing classes, transracial classes, and a few other panels. I wish that we had more time to do a lot more classes, or that I could split myself into two and been able to attend two classes at once! It was really great and I want to go again next year! Most of the people there were from Utah but there were a few of us from other states. I think we were the only ones from MI. We were able to get together with a few friends after the conference, Chris and Theresa. They had some great advice for us. I'm so glad we have friends who have been touched by adoption. They told us about this amazing group out in UT, The Genesis Group! We just happened to be in town on the night of their fireside. So we went! It was absolutely amazing! The group is a Church organized support group to serve the needs of the African-American Latter Day Saints. Anyone is welcome to attend the firesides and I highly suggest it.